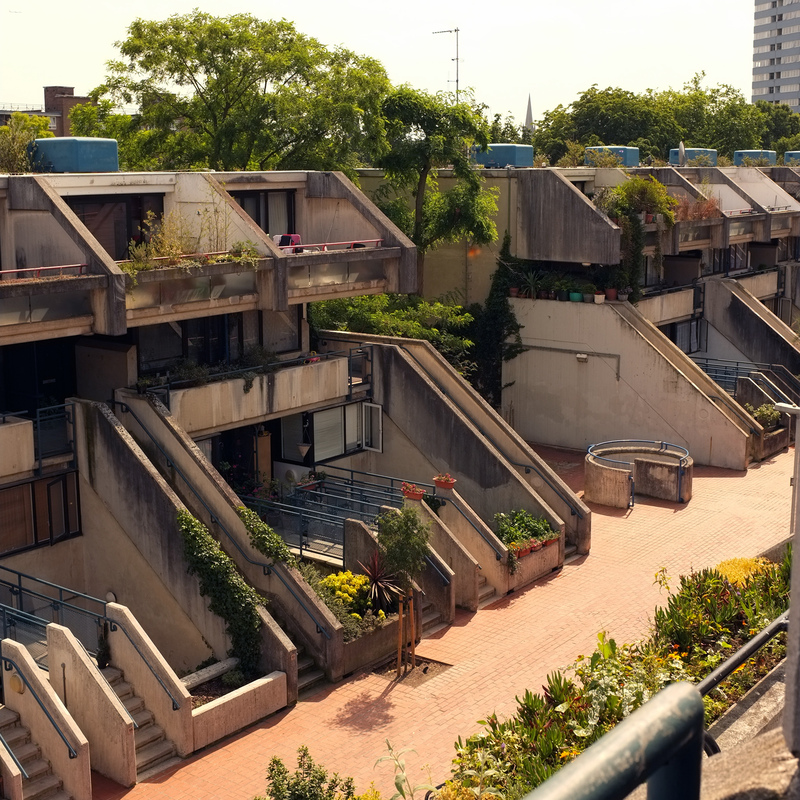 Alexandra Road is perhaps the most iconic estate creating during the glory days at Camden Borough Council – when large scale social housing projects were still high on the agenda. 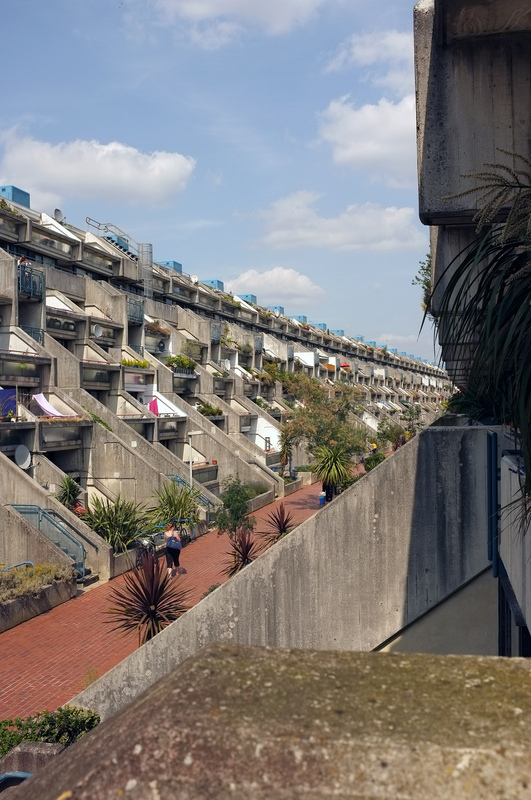 The estate was designed and constructed between 1968-1978 by architect and artist Neave Brown. The scale of Alexandra Road feels very different to that of the later projects I visited by Brown’s former assistants Gordon Benson & Alan Forsythe; Maiden Lane (https://socialskillsarchive.wordpress.com/2013/01/21/social/) and Branch Hill (https://socialskillsarchive.wordpress.com/2013/04/01/maiden-lane/), which have a lower density and a more open aspect to their surroundings. I entered the estate from the East, through a sort of elevated park, with areas for recreation and planting, crossing a bridge over a parking deck towards the terraced apartments before descending to the main pedestrian route through the estate. The gentle curve of this red brick street divides a 7 storey ribbon of terraced apartments from a series of lower 4 storey maisonette blocks. The spaces between these blocks lead to a small park and children’s play area, bordered to the South by another row of maisonettes. The party walls are strongly expressed in the timber shuttered concrete walls which divide neighbouring terraces and define the stairwells. These regular vertical elements are united by the horizontality of the terraces and the heavy overhang of the upper deck. The stepped form of the section creates a dramatic and distinctly urban landscape – an intensely communal structure. 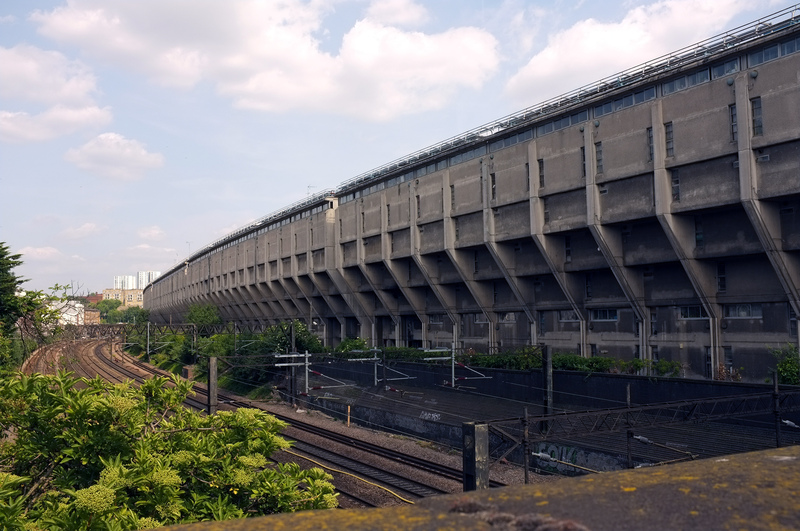 The long terraced blocks are reminiscent of London’s georgian terraces – where a few carefully proportioned components are repeated to create a monumental whole. Parking is accommodated below the residential complex, in a vast parking deck, with access via spiral staircases, located at break points in the lower maisonette blocks. 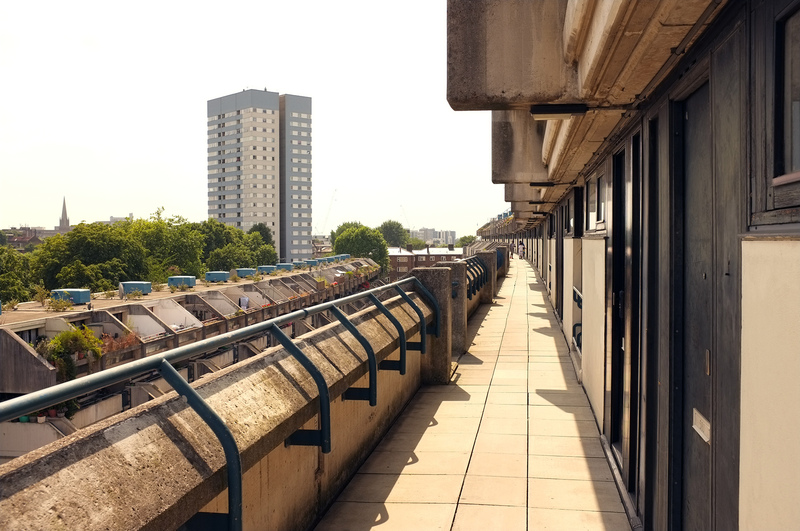 Even on a bright summer’s day, the potential for crime in this poorly lit and readily accessible undercroft was clear – probably the least successful element of the project, this is a weakness echoed in the Maiden Lane estate. The access decks, or ‘steets’ at high level offer views over the surrounding borough. Access throughout the estate is surprisingly free, and a visitor can wander through the estate without the ubiquitous key fob we have come to expect in more recent developments. This works well in the terraced upper levels, where there are strong visual connections between the dwellings and the communal areas, but is less successful in the deep stairwell reveals and blind undercrofts. The estates curved form is informed by its Northern boundary – the West Coast Mainline tracks. From the North the estate is more reminiscent of a sports stadium than a residential complex. Here the vertical party wall lines are again strongly expressed, forming vertebrae along the uncompromising concrete backbone of the estate. This concrete screen forms an acoustic barrier, but is also a grand protective gesture. A very fine spread on Alexandra Road! Years ago (1984) I was fortunate to be able to take a rare undergraduate design studio with Neave Brown when he was a Visiting Professor at Washington University in St Louis. The following summer I was in London for a few weeks, and to my surprise I was invited over to his fabulous Windscombe Street house for dinner with his family. I went to Alexandra Road the next day and he joined me for what was a rather special tour. Around the School of Arch at WU he was generous, engaging and intense; an intellectual and an artist with none of the pretense of either but he didn’t suffer fools! I chatted with him a few times late in the evening in his office and saw the amazing ink and mylar drawings he was producing for a (ultimatley unbuilt) project in Italy. During the dark days of Thatcher I don’t think he got much notice.I’m glad to see his work has been rediscovered to an impressive degree and is now much admired. I did see his recent talk at the AA (at their on-line website)….he hasn’t changed a bit. Thanks David – Sounds like you had the ultimate guided tour! Did you go inside any of the units? I would love to get inside… I think a lot of the flats are now privately owned (probably by architects!) so if one comes on the market, i might go and have a look around. ….this is a very late reply, but no I did not have the chance to enter a flat at Alexandra Road. In recent years, many units have been offered for sale so a good many interior shots from those offers can be found on the internet.